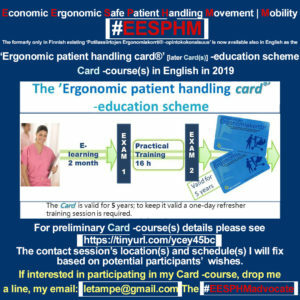 🔷 ‘Ergonomic patient handling card®’ -course(s) in 2019 in English. Will there be (an) Economic Ergonomic Safe Patient Handling Movement/Mobility #EESPHM course(s) in 2019 in English? ✔ a 2½-3½ days contact sessions including ½ a day Exam = demonstrations of practical skills. dedicated & specialised among others in nursing management, SPHM and ergonomic consultative services, lecturing and training. Full CV in Finnish (Ansioluettelo). 1976 – Turku Regional Finish Institute of Occupational Health (FIOH) at first as occupational physiotherapist second as assistant research scientist third as a research scientist and last as a specialised research scientist. EGOCAREBANK The Ergonomic Databank for Social and Health Care. Leonardo da Vinci, Transfer of Innovation –project. 1.10.2013 – 31.9.2015. Finnish, Estonian, Greek and Swedish partners create ergonomic solutions for elderly care. Participating in the EU-project 1.9.2010-30.08.2011: Best practices for innovation in ergonomics in health care -for improvement of working conditions and quality of care. In the project, good practices are taken to The Czech Republic, Slovakia and also to Spain. Nordic Tour 2011. Creating Good Practices for Elderly care work. 15.2. -29.3.2011. Participating in the international standardising TR ISO/CD 12296 writing group. Founding member of (IPPHE) International Panel on Patient Handling Ergonomics established 2004 as (EPPHE) European Panel on Patient Handling Ergonomics. working in that field since 1976, assisting in problem-solving in a wide variety of settings (office, hospitals, manufacturer, shipbuilding & service fields like kitchen & cleaning etc.) & implemented concepts of healthy body mechanics & workstation design for the benefit of both injured workers and those seeking to prevent injury. As a Specialized Research Scientist at Finnish Institute of Occupational Health (FIOH) she dedicated over three decades to ergonomics and prevention in the health and social care work, – studies of physical strain of health care workers, – several intervention studies in the healthcare sector,- writing among others two Finnish textbooks for Patient Handling, one for students and one for teachers. In 2007 FIOH entrusted Leena with the development of the standardized national ergonomic teaching scheme of patient-handling in healthcare education. This was supported by the Social and Health Ministry. During two years pilot phase 2007-2009, specialists of an interactive communication network participated in the development work. The result was published in 2009 as the Ergonomic patient handling card which is registered since 15.10.2010 as ‘Ergonomic patient handling card®’ -education scheme. As a member of the writing group of the Technical Report ISO/CD 12296 Ergonomics she contributed to the “Manual handling of people in the healthcare sector”. The physical strain when assisting a patient to move – An ergonomic evaluation of three transfer methods. The University of Turku, Faculty of Medicine, Occupational Health. of the study was to find out if the new transfer methods, Durewall and Kinaesthetics, were less strenuous than the presently used method, and to find the least strenuous method which should, at the same time, be safe and comfortable for the patient and allow her/him to take part in the transfer to the limit of her/his capacity. included twelve female nurses and 18 patients. Patients’ functional independence measure was low; one or two. The nurses were assigned to two groups and they received training in both new methods, but in a different order. Nurses assisted a patient from the wheelchair to the bed and vice versa in three test sessions: before the training, after learning one method and after learning the other method. The nurses’ skill in assisting a patient to move was evaluated with a new observation instrument, SOPMAS. The lower back and trapezius muscle activity of the nurses was measured by video EMG. The nurses rated their perceived physical exertion in lower back and shoulders on Borg’s CR-10 scale. The patients rated their feeling of security, control and comfort on a bipolar rating scale, and their muscle activity was measured in the knee extensor muscles. their skills developed from the lowest level to the second highest level after the first training session. After both training sessions, the group receiving the last Kinaesthetics training reached the highest level of skill. Applying both new methods their measured and perceived physical strain was significantly less than when applying the presently used method. The muscle activity and perceived physical exertion were reduced by 60–75 % in the lower back and 27–57 % in the neck and shoulder area. The patients’ feeling of control in the trans¬fer situation and their measured activity was higher when the new methods were applied. Patients also rated the new methods as safer and more comfortable than the presently used methods. The better the nurse’s skill, the greater comfort, safety and control patients experienced when being transferred. However, there was no significant difference between the new methods. This study shows that the patients’ support from somewhere other than the nurse is an important factor in decreasing the physical load of the nurse. Another factor is that the patients are better able to participate in their transfer when the nurses learned to activate them more effectively and gave them more time and space to do so. The results can be exploited in making nursing physically less heavy and in improving the quality of nursing. The most important is to apply the new evidence in the professional training of nursing staff. Tamminen-Peter L. Wickström G. Completely revised patient transfer book: Potilassiirrot – Taitava avustaja aktivoi ja auttaa, Finnish Institute for Occupational Health, Helsinki 2013. Tamminen-Peter L. & Fagerström V. Ergonomic Patient Handling Passport – a concrete tool for improving nurses’ competence in Ergonomics. Proceedings of NES-conference 2011, Oulu 18-21.9.2011. Tamminen-Peter L. Staff Education and Training in ISO standard (ISO TR 12296) “Ergonomics – manual handling of people in the healthcare sector. HEPS 2011, Oviedo, Spain 22-24.6.2011. Tamminen-Peter L. Experience with physical risk management model in Finland. Creating Good Practices for Elderly care work. 29.3.2011. Oslo, Norway. Tamminen-Peter L. Ergonomic patient handling passport – a concrete tool for improving elderly care in Finland. 18.11.2011. Reykjavik, Iceland. Tamminen-Peter L. Ergonomic patient handling passport – a concrete tool for improving elderly care in Finland. Creating Good Practices for Elderly care work. 10.3.2011. Copenhagen. Tamminen-Peter L. Fyysisten riskien hallinta vanhustenhuollossa. Creating Good Practices for Elderly care work seminar. 15.2.2011. Helsinki. Tamminen-Peter L. Training as a part of Risk Management of manual handling of Patients in TR ISO/CEN 12296. ORP-konferenssi 5-7.5.2010 Valencia, Spain. Tamminen-Peter L. Patient Handling Instruction and Training in Europe, Initial situation and requirements. Ergonomic Patient Handling – Current Status and a European Perspective. Workshop 18-19.11.2009. Berlin. Tamminen-Peter L, Fagerström V, Moilanen A. Physical Risk Management Model as Part of Safety Management System in Elderly Health Care. Proceedings of the 17th Congress of the International Ergonomics Association, 2009. Peking. Leena Tamminen-Peter Developing the teaching of ergonomics in healthcare education. Sixth International Scientific Conference on Prevention of Work-Related Musculoskeletal Disorders. 27-30 August 2007, Boston, USA. Karhula, K & Tamminen-Peter L. Healthcare students’ perspective to the teaching of patient handling ergonomics in Finland Nordic Ergonomics Society 39th Annual Congress, Lingatan, Lysekil, Ruotsi 2.10.2007. Abstract in Congress book, p. 149, full text in congress CD. Tamminen-Peter L., Stenholm S., Hantikainen, V. & Arve, S. 20 An ergonomic evaluation of three transfer methods. In Proceedings IEA 2006 Congress. The 16th World Congress of the IEA, Maastricht 9.-14.7.2006. Tamminen-Peter L1, Stenholm S2, Hantikainen V3 & Arve S4 An Ergonomic Comparison of Patient Transfer Methods. In Proceedings of NES 2006. ss. 144. NES 38.th Annual Congress 24-27.9.2006 Hämeenlinna. Rantsi H, Tamminen-Peter L: 2006. Training of patient-handling activities at the schools of health and social care. In Proceedings of NES 2006. ss. 220. NES 38.th Annual Congress 24-27.9.2006 Hämeenlinna. Tamminen-Peter L. 2005. Patient handling ergonomics in Finland. 2005. Healthcare Systems Ergonomics and Patient Safety. 2005, 30.3.-2.4. Florence, Italy. CD and a book by Taylor & Francis, London 2005. ss 407-410. Nevala N. & Tamminen-Peter L. 2004. Ergonomics and usability of an electrically adjustable shower trolley. International Journal of Industrial Ergonomics 2004; 34 (2): 131-138. Tamminen-Peter, L. 2004. A psychophysical comparison of three patient handling methods, when assisting the geriatric patient to move from wheelchair to bed. Premus-konference in Zurich 2004. Tamminen-Peter, L. Hantikainen, V. & Tuomisto, R. 2003. Can improved transferring skills reduce muscle strain while assisting a geriatric patient from a wheelchair to bed. Addresses and Abstracts WCPT 14th International Congress, Barcelona. Hantikainen, V. Tamminen-Peter, L. & Arve, S. 2002. Development of the observation instrument for assessment of nurses’ individual performance and learning in patient transfer tasks and patient participation in locomotion activities. In Abstracts book in 11th Biennal Conference of the Workgroup of Europian Nurse Researches (WENR), 2-4-9. 2002, Geneve, Sveitsi. Tamminen-Peter L. 2000. Ergonomic Restrictions due to Inadequate Facilities for Nursing. In Proceedings of the XIV International Ergonomics Association and 44th Annual Meeting of the Human Factors and Ergonomics Society “Ergonomics for the New Millennium”; 20.7. – 4.8. 2000 San Diego, USA. Tamminen-Peter L. Pentti J. & Wickström G. 1999. Occupational Strain and musculoskeletal symptoms in Long-term Care. In Keynote Addresses and Abstracts. The 4th ICOH International Conference for Health Care Workers; 1999 Sep 28-Oct 1; Montreal, Canada. Tamminen-Peter L. 1993. Five-year follow-up of back pain prevention in nurses. Occupational Health for Health Care Workers. Ecomed, Landsberg. Ergonomiakortti – ‘Potilassiirtojen Ergonomiakortti®’ päyvityskoulutus -Päivitä korttisi ! © ERGONOMIC TRAINING – SERVICES – CONSULTANCY – LECTURING.